Jamshedpur FC launches its own Grassroots Programme! Home / Indian Football / Indian Super League / Jamshedpur FC launches its own Grassroots Programme! Jamshedpur FC has launched its JFC grassroots programme for the first time in Jamshedpur with Kundan Chandra heading the programme. Kundan, a retired Indian Navy officer with the background of aeronautical engineering has a rich pedigree of coaching background. He is an AFC ‘A’ Licensed Coach, FIFA Grassroot Instructor, AFC ‘C’ License Instructor and an AIFF ‘D’ License Instructor. 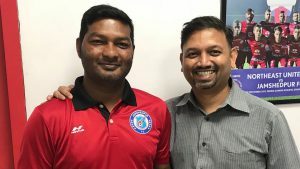 Since 2001, he has served as coach of the Services senior team, Indian Navy senior team, Maharashtra youth team, Maharashtra and Gujarat Senior team, Mumbai FC (Head of Youth Development, U-16 Team Head Coach and Assistant Coach to the Senior Team), WIFA State Development Officer. The programme will kickstart with a workshop for the coaches which is an open session for anyone above the age of 18. The dates will be from July 16-18 and the venue will be the Tata Football Academy. The timings of the workshop will be from 9am – 6pm on the abovementioned dates. This will be followed by a football festival for kids under age group of 5 to 12. The schedule for the same will be announced in due course. Previous India Women coach Maymol Rocky: Primarily focusing in improving the fitness levels! Next AFC team on futsal assessment visit to Hong Kong!